Good morning...it's dreary and misty this morning. I wish I was telling you it is snowing, but snow is nowhere to be seen around these parts and none predicted...boo hoo. 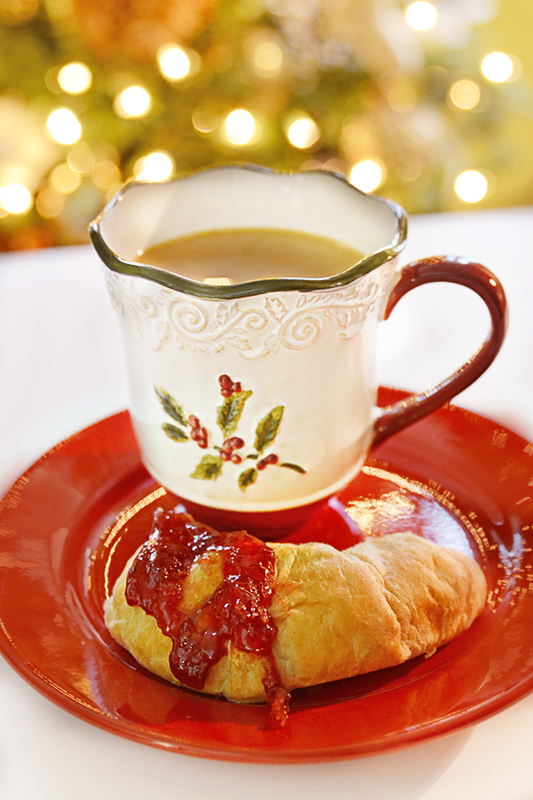 But I am enjoying my morning cup with a croissant and cherry jam. Takes a little of the boo hoo's away. I am still decorating...I seem to have turned this into an event. Yesterday I decided I needed to go to Hobby Lobby to pick up just a few things. Well, 5 bags (they were small) later I was back home and digging back into the never-ended decorating. Maybe if I would stay focused (?) I would get it done. I did buy a few new things to add to my decorating. What am I saying....I have so much Christmas stuff, the last thing I needed was one more stuff to decorate. Nevertheless, I did it and I will post all of my results when complete. This Santa is definitely not new....I do believe he is my favorite Santa. I used to be a big-time Santa collector, but then it just got ridiculous and thank goodness I was able to put a stop to the madness or I would have turned into one of those crazed collectors that turn whole rooms into a display of Santas. This particular Santa was the MOST expensive Santa I ever bought in my crazed days. I think he was over $100 dollars which, when I was collecting these gems, was totally out of my Santa spending budget. Do you remember my "grateful tree" for Thanksgiving? The birch twigs that I gathered from the yard? 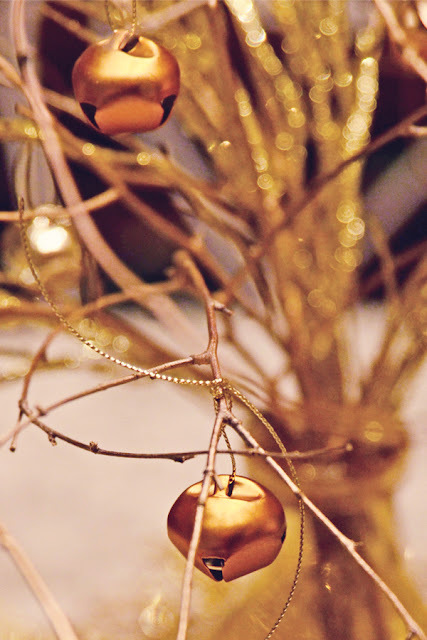 Well, I recycled those twigs and am using them again in a "jingle bell" tree for the dining room table. I sprayed them gold, and added some glitzy sprays (Hobby Lobby), hung jingle bells and voila. I think this year I am sending postcards for my Christmas cards....I am expecting a shipment today from Red River Paper that has plain postcards to print your own. And since I have my fancy new printer I am delving into it this weekend, since the shipment is due today. This may be one of the cards....ahh what you can do in Photoshop!! I added the sparklies and the "Merry Christmas" digitally. OK that is definitely enough....I must get back to the decorating. Hope you are having a wonderful holiday season. Sharing with Kim & Xanthe's Five on Friday. Your jingle bell tree is soooo cute! I thought about postcards this year but stuck with the traditional ... maybe next year? Thanks, as always, for the inspiration. love your jingle bell tree. 5 bags later. ha ha! I am living vicariously through you. Can't wait to hear how the printer does. Hi Deanna, I'm getting used to sharing my day with you and enjoying your decorating vicariously. 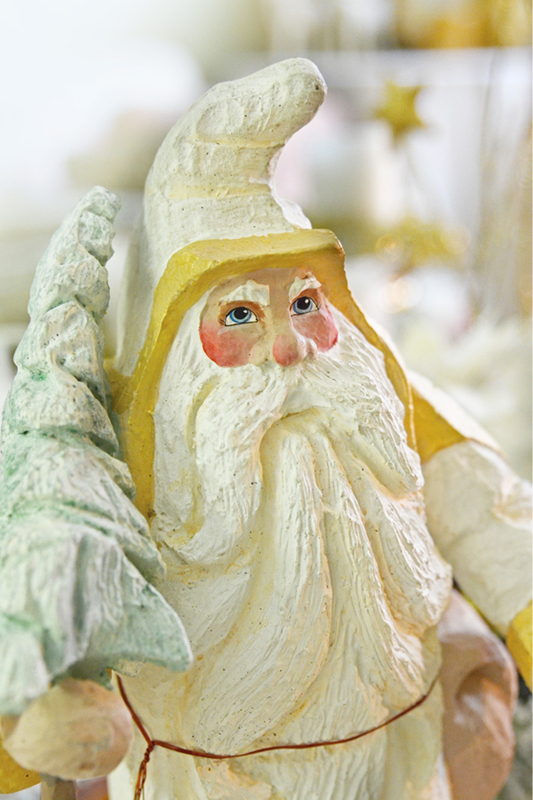 I also collected Santas and have some beautiful ones. I haven't unpacked them in several years. I should bequeath them to my kids! I'm using 2 this year in the city - most are stored away in Breckenridge. Deanna! wow! these photos are amazing. you are so talented, let me tell ya! the tea and croissant sent me into outer space, man. looks so delicious. and the white tree ornament that says 'Merry Christmas' is my style of decoration. cool. I love your santa, I have a few also and haven't taken them out this year. I really need to get out in the garage and go through all the Christmas stuff I have and pair so much down. Must do that, if I keep saying it it might come true. Lovely Christmas card, I like the added sparklies too. My early resolution for next year is to get into Photoshop :-) Your decorations glow with warmth! I love your choice for the card ... very nice! I managed to finish my decorating earlier than I normally do! What a surprise!!!! Hobby Lobby? We don't have one here but when I go up to NH or RI I make sure I stop in and spend! My mom was a big time Santa collector. When she passed I made a tough decision to not keep all of them and sold many (30-40) at the Estate sale, a hard choice at the time. I still have many, but am okay with my decision especially after visiting the attic today to hunt for something, only to be reminded to the boxes and boxes of dishes and things I kept thinking I'll pass them on to my children. Absolutely love your re-purpose twigs (in fact, inspired) and adore your processing in that last shot. I love your recycled Thanksgiving twigs....your Santa looks carved...is he? And John Lennon sure got a lot of things right, didn't he? Love your Christmas postcard picture, too...those twinkles are to die for!!! 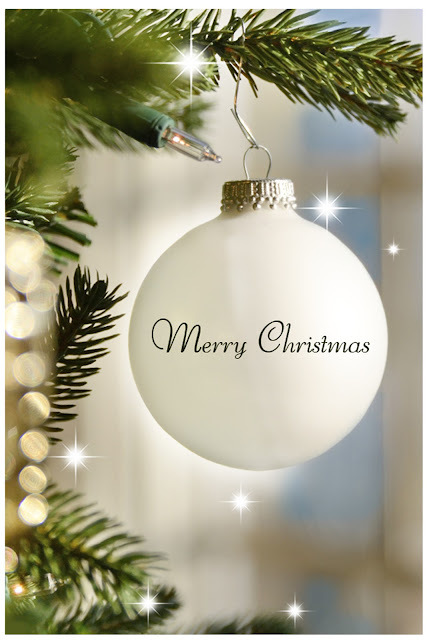 Beautiful Christmas postcard and love the jingle bell tree! 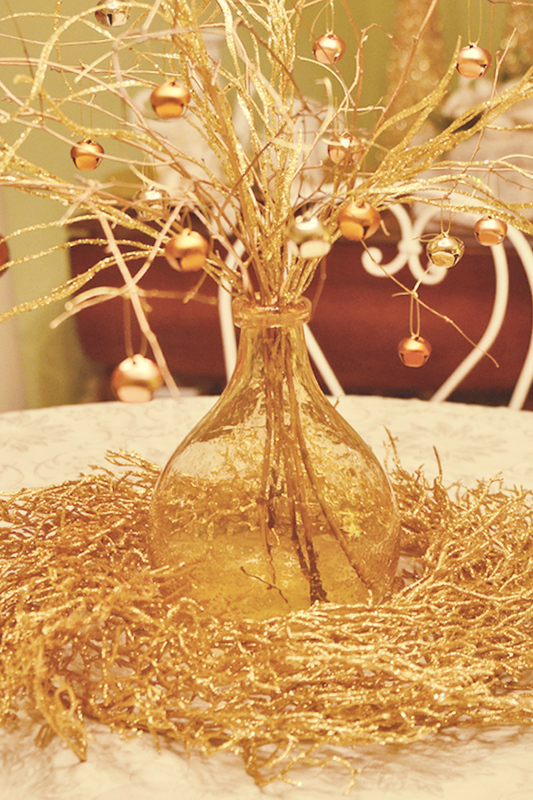 You're so creative, Deanne, I love the golden branches! The Christmas Card is so beautiful! I always blame pinterest for my lack of sleep. Hee Hee.. It sure is addicting. Love all your photos and postcards is such a wonderful idea..